Dyane: All is not well. – HubNut – celebrating the average! Dyane: All is not well. When you buy a seriously cheap Dyane, that was parked up on a farm for many years, you can expect one or two problems. That’s fine. I didn’t pay ‘perfect’ money. In fact, I barely paid any money in Dyane terms. I have no quibbles. But, I do have quite the To Do list. 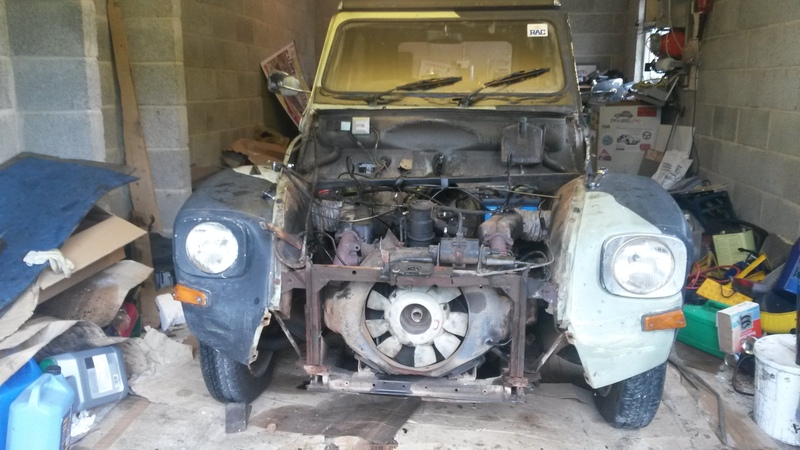 I removed the sleeping Perodua from the garage and into the rain this morning, and inserted the Dyane. I let it dry off while I consumed breakfast. Then I gave the engine bay a proper look-over. The sort of look-over I should have done before driving it 172 miles really. Oh well. Talking over an odd noise it was making under light throttle left someone suggesting I should check the intake side of things. It didn’t take long to find a problem! Oooh! That isn’t helping. The bolt has gone completely. A missing bolt. The other one this side was finger tight. Naturally, the thing to do here would be to insert another bolt. The cylinder heads are aluminium, and it’s terrifyingly easy to strip the threads. Is that what had happened here? I couldn’t get a new bolt to start, so decided the best course of action would be to remove the manifold and see what’s what. After dismantling the exhaust system and removing the alternator, things looked like this. 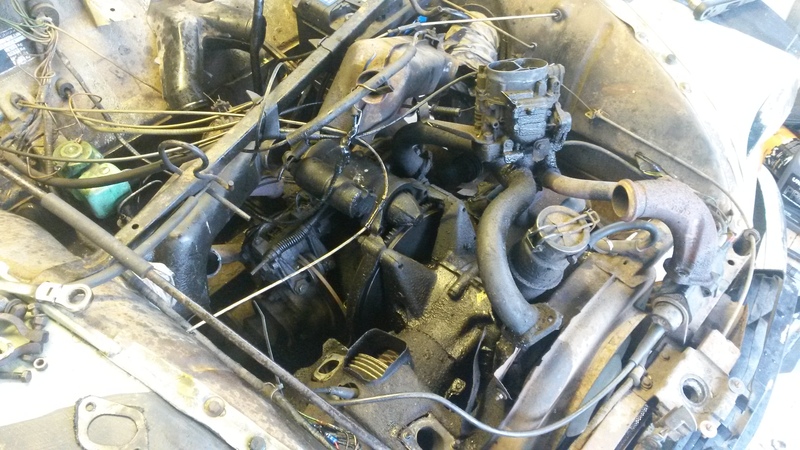 Under this soup of misplaced parts is an engine. As it happens, this was all a bit unnecessary. I ran a bolt into the thread with the manifold removed, and it seemed to go in nicely. Only one thing for it – put it all back and bolt it down. Success! All the bolts torqued up (the setting is very low) nicely. I didn’t have quite so much luck reconnecting the exhaust system though – new clamps may help there as the old ones are a bit tired. It’s always a fiddly faff. I shall try again when freshly enthused. I did check the valve clearances though, and opened up the inlets to the recommended 0.25mm. The exhausts were already at the ideal 0.30mm. Problem Two was pinking. Now, the inlet leak could have been responsible, but I suspected that the ignition timing was off. No problem. Quickly get the fan off to check the state of the points and the gap, then time it up. Only the fan didn’t want to come off. I was forced to faff about removing the front panel to gain better access. Eventually, after much clouting of my drift, the fan came off its taper. Rusty bolts hindered front panel removal. Once the fan was off, I was horrified to discover some serious impediments to the cooling system. 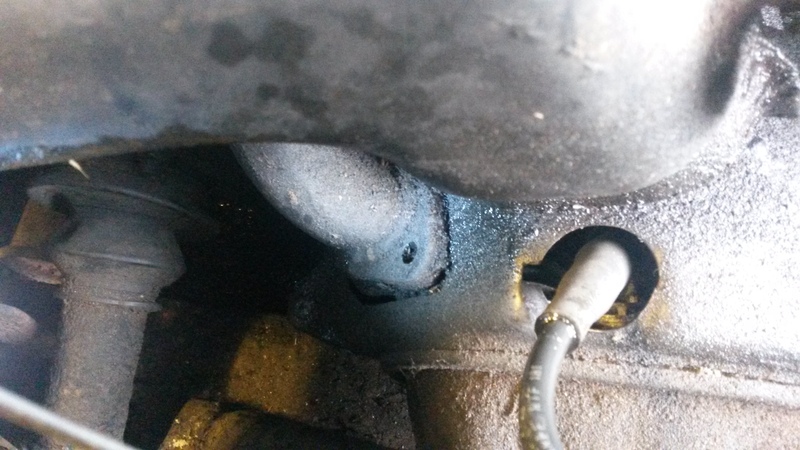 It looked like a plastic bag had got sucked in at some point, with remnants seriously hampering air flow over the cooling fins of the nearside cylinder head. Worse, some bits were blocking the oil cooler. 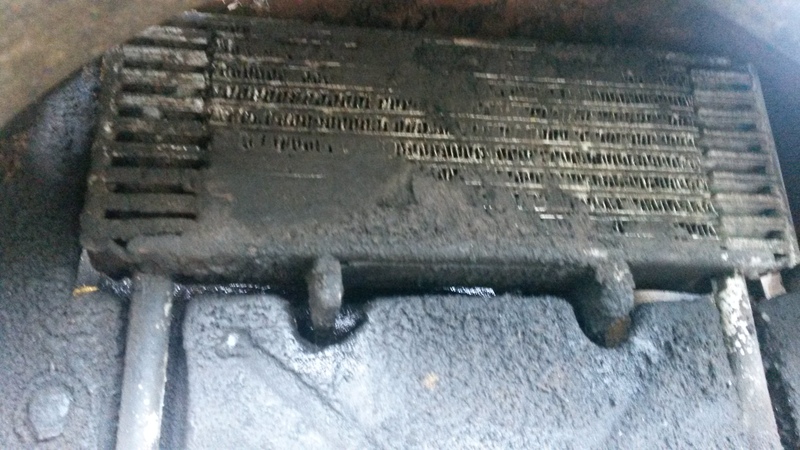 Worse still, behind that, the oil cooler looked like this! That’s not good at all. Aircooled engines tend to rely on the oil itself being cooled. I was starting to wonder just how this poor little car had got me home. A major intake leak and much-hampered cooling. The best way to clean the fragile cooler is by using compressed air, blowing from the engine side. I had no compressed air, so went for a different strategy. Gently brushing degreaser over all the muck, then squirting water through from behind with a hose. Very, very messy, but it did the job and I only mildly soaked myself. The ignition timing was way out – several teeth too advanced. Again, how it got me home without holing a piston I don’t know, but clearly I had successfully driven around the issue, as described last time. You should never just let an engine pink. It will end badly (modern cars have knock sensors to avoid this happening). I created a new timing mark, though I need to revisit the setting next time I’m tinkering. With unleaded fuel creating a hotter burn, the experts reckon it’s wise to retard the ignition timing by one tooth. That’s ok as I ran out of time today and simply downed tools once I’d reset the timing. Engine-wise, I also still need to see why the idle is lumpy and unsettled. The spark plugs are new, so it shouldn’t be them. It could be the mixture perhaps, as it seems to idle nicely when on choke. I did try unblocking the carburettor jets with the ‘hand on top of carb at revs’ trick but it didn’t make a difference. As they traditionally say at such times, TO BE CONTINUED. Thanks. My requirement of the car was that it had MOT. I didn’t pay enough for it to be comprehensively sorted out. I should have checked more thoroughly myself given how long it was off the road. I’m not dropping the oil until I’ve stopped it leaking so much. Could be a tired breather, but could also be oil cooler unions and or pressure switch.